Hexagon Metrology extends basic range of multi-sensor portfolio. The demand for user-friendly and economic multi-sensor measuring machines at starter level is on the increase in the European market. 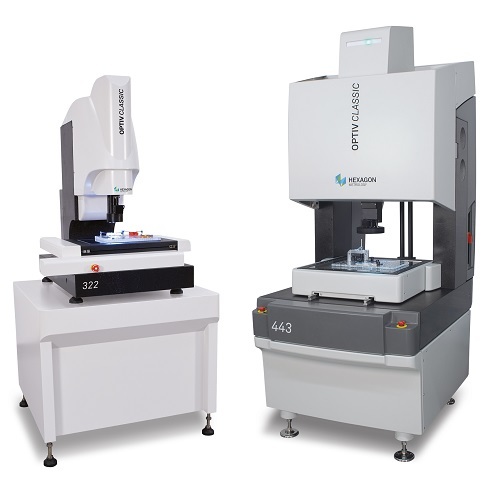 Hexagon Metrology is now introducing three new Optiv Classic models: Optiv Classic 322, 432 and 443. The machines are particularly suitable for measuring flat parts such as punched components, circuit boards, foils or stencils, die cast and injection moulds, and precision parts. The standard equipment of these compact entry-level machines includes Vision-Sensors, which consist of a CCD camera with CNC motor zoom.They are complemented by the optionally available TESASTAR touch trigger probes with which full multi-sensor functionality can be created. The optics are used for measuring minute characteristicswith very small tolerances without contact. At the same workpiece it is possible to use the touch trigger system to take measurements – in the same program sequence and without re-clamping. The new models are offered including a rugged subframe. The measurement ranges are 300 x 200 x 200 mm, 400 x 300 x 200 mm and 400 x 400 x 300 mm respectively. Hexagon Metrology supplies all Optiv models with the PC-DMIS Vision metrology software. PC-DMIS Vision has been specifically designed for optical and multi-sensory measuring machines. Its features include feature-based measurements, functions for fast editing of measuring programs and a comprehensive image processing functionality. The new Optiv Classic models with PC-DMIS Vision are available as of now from all Hexagon Metrology subsidiaries and distributors in the EMEA region (Europe, Middle East, Africa). For more information, visit www.hexagonmetrology.com.